The ‘Aurora Green’ diamond, a spectacular rectangular-cut gemstone weighing 5.03 carats, recently sold at auction in Hong Kong for $21.8 million AUD. As of June 2016 it holds the official world record for the highest price ever paid for a green diamond. It is no coincidence that the auction was held in China – for the Chinese, the colour green symbolises growing, striving, claiming, healing, and patience among other favourable meanings. (However, if you wear a green hat, it symbolises that you have an unfaithful partner, so this diamond is unlikely to be set into a hat pin!). Why is it so valuable? 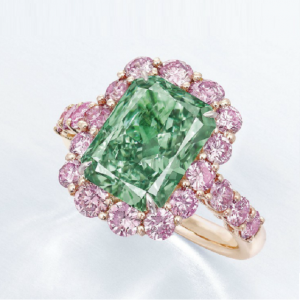 Firstly, this diamond is an extremely deep shade of green – green diamonds acquire their colour whilst forming from natural radiation inside the earth. This occurrence is so rare that most people won’t see a green diamond in their entire lifetime. Secondly, the Aurora Green’s weighs 5.03 carats – even coloured diamonds as small as 0.10 carats are extremely valuable, let alone one this size! This diamond truly is an incredible feat of nature.